At a glider you play a game and your score determines which slot you take. The higher the score, the higher the slot. The player who had the slot will glide down to the slot below it. The player on the lowest slot will glide off the board. * Each game that is played each slot (and thus the person who holds that slot) will get 10% of the amount paid to the game. * Another 10% is added to the jackpot. 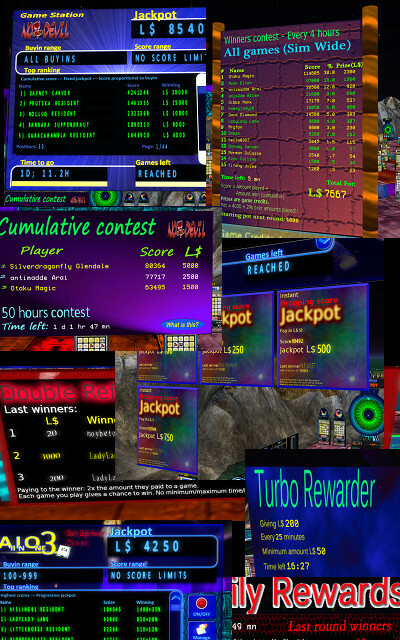 A player who beats the jackpot score will win the amount in the jackpot. The jackpot is paid instant. The higher you score, the better. When another player takes your slot, you won’t get off the board but instead you glide down one slot. An example: Suppose you score 73,000 points on one of the No Devil games below this glider. In that case your name will appear at the slot from 70,000 to 79,999. The player who already has that slot will move down to the slot below, taking his winnings with him, you will start with L$0. All other players below will move one slot down. The last one will no longer be on the board. His winning of L$6 will be paid to him. And, all slots grow with 10% of the amount you played. That is L$10 in this example. Your slots and all other slots will see L$1 added to them. The jackpot will grow too. When you reach a score of 110,000 or above: You win the jackpot. The gilder will pay you the jackpot amount (in this example L$709) and add your name as the last pot winner. You won’t take a slot in this case. All slots of course still get their 10%. When you reach a score lower than the lowest slot, in this example below 30,000 points, you won’t win a slot. Of course the amount won for each slot will still be increased with 10% of the amount played, as will be the jackpot. You do not have to wait for your winnings on the slots until the moment you drop off the board. You can cash out your winnings so far any time you like. Just click the Cash out button on the board. You might notice that sometimes the jackpot grows with less than 10% of the amount you played. That is correct, but on the other hand the pot also does not start with zero when it is won. The glider will always present an attractive pot. In order to guarantee an exactly 90% payout, a part of the amount added to the pot is used to finance the starting pot. Gliders give exactly 90% of the amounts paid to the games back to the players, no more, no less. This of course not equally divdided because that would be dull. Get high scores and win big!! 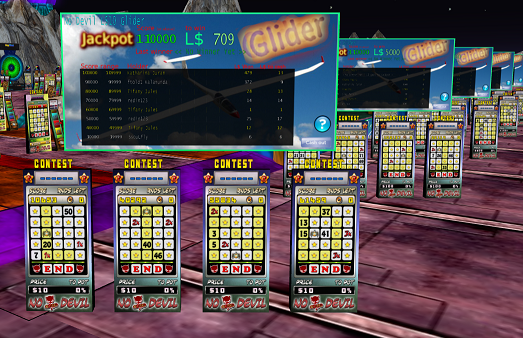 For each 100 L$ played on the gliders, 90 L$ goes to a winner, either slots or jackpots. Some might win large wins, other small ones, but the sum for all is 90. No more, no less. 90% is already not a bad pay out percentage, but above that there is still a long list of rewards and extras. With Glider you compete with players who play the same glider, before you, at the same time or after you. With the contests and rewards you compete with players who play at the same region.